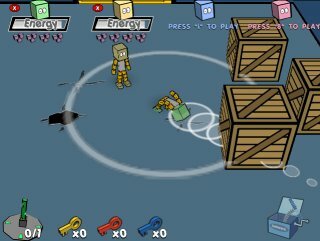 BlockHeads Clash EX should be released sometime late next week and will be available for both the PC and Mac. In the meantime, if you have any comments or suggestions feel free to post below. This is the 29th day I’ve been working on this game from the point of conception. I’m proud of the progress I’ve made so far. Again, any feedback you guys have let me know. If I get it in time, I might even be able to add some of your suggestions to the EX version. Where did this come from (Prepare to Beta Test)? Some of you are probably thinking, “Don’t you already have enough to do? Why are you working on ANOTHER game?” Well a few weeks ago, I received an e-mail from someone saying they really liked my games but I take too long to release new ones. He had a point. I initially posted the mini-golf web game for public consumption back in December of last year and my last proper game download release was February 2005! We have some really cool stuff in the pipeline (Cityscape Battle, Mini-Gofl Deluxe, and Socio City). But I agree game releases have been very thin. Since I also just recently pulled Pow Pow’s Great Adventure, I thought it would be a good idea to do a quick 2-3 week project to fill the void as well as give something fresh to players. The result is BlockHeads Clash. I also wanted to prove to myself that I could actually finish a 2-3 week project with it remaining a several week project instead of ballooing into a several month project like just about all my other games. So after many sleepless nights and sleep filled days, the game is close to being done and I’m on day 19 since conception. Now I’m in the testing phase. This is where you guys come in. If you would like to beta test BlockHeads Clash, simply signup to our Forum and go to this topic. I’m looking to get the game completely done sometime late next week. So regardless, you should be able to play pretty soon. - Be the first to know when our games are available. - Know about opportunities to Beta test our games. - Receive special offers and discounts. You are currently browsing the Outside the Box Software - Game Development Diaries weblog archives for September, 2006.